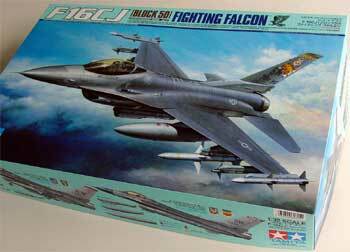 The Tamiya kit of the F-16C is impressive as seen on this page with details. 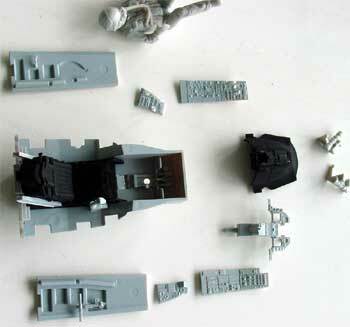 (this page compares it to other 1/32 F-16 kits). 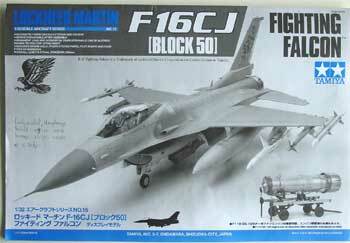 The Tamiya kit will be used to model a F-16C Block 50 as provided by the parts in the kit. It will also be improved in some areas, especially at the lower aft fuselage area at the engine (but more on that later on). Also for that reason, the engine bay will be closed with no detailing inside the engine bay. The engine will be made as a separate model to be placed on its supplied dolly. Also, it was decided to close the gun bay and the ammo drum bay. Alternatively, you can set these open with the nice detailed goodies you get with this kit. Begin first by making small sub-assemblies and than "pre-painting" smaller parts. This will take quite some work as there are many parts in this nice Tamiya kit. Some airbrushing I do with parts still in the sprues as seen here. Also Eduard etched metal set # 32-128 was used for the kit, although you do not really need it as the kit has very good detailing. Step 14: Assemble the engine intake by adding part #B31. Make sure to get a good alignment to hide the seam. 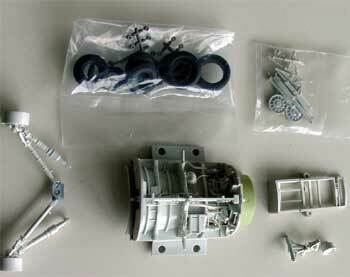 (The engine bulkhead parts are not applied to this kit and will go to the spares box as it was decided to assemble the engine bay closed). Step 16 is not required for this model. Step 17: only the main gear bay intake section is installed. I had some troubles to get the screws entirely in the plastic. In step 15, at the end of the intake tunnel, a spare engine compressor face was installed (I used a spare part #H1 from the Academy kit). 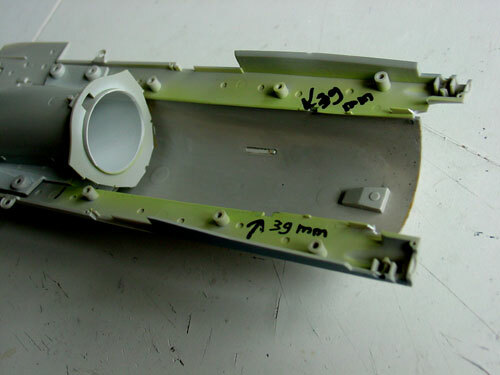 Steps 18 + 19 : assembly the nose gear leg as shown. However, it will not be yet installed as suggested in step 19. I cut off the notches. Also I did not use the screws MB3 as they are very difficult to get fully into the plastic without force and cracking the assembly. Steps 20, 21 with intake scoops were assembled as shown. Some putty was needed here. Do NOT yet do step 22, skip this one! Step 23 with the main gear legs were assembled as shown. I left off the tires obviously. Some detail painting will be done later on. 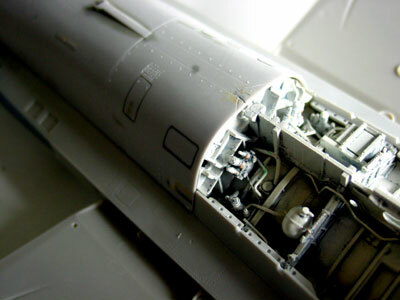 The whole assembly of nose and main gear, and bays was sprayed white and detailed with some extra sprue and rod and details added with various colours. 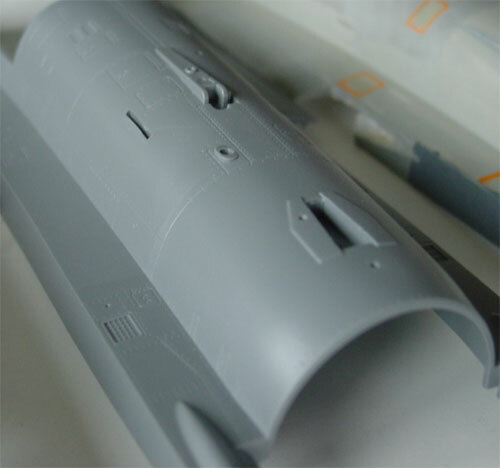 The Tamiya kit has an inaccurate aft lower fuselage section at the engine area. It seems that Tamiya had to make a compromise in here as the engine provided is "removable" from the model. 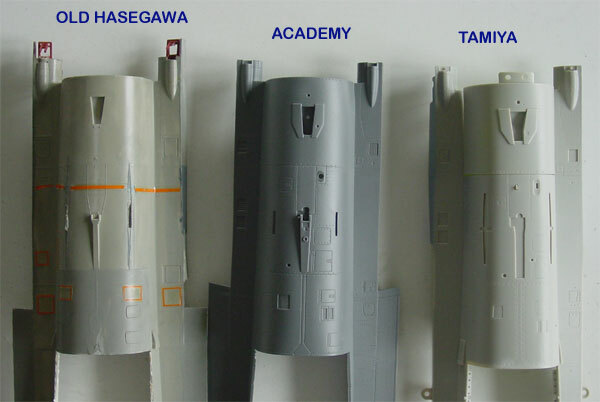 Compared to actual pictures and the Academy and Hasegawa models, the cross section is not curved enough, but a bit to much squared, especially at the ventral fin area and at Tamiya part # B20. Also, it was decided to try to make the provided Tamiya engine stand as a model on its own. This required to do some changes on the exhaust pipe assembly for the separate engine. I will use spare parts from the various kits. So, after this work, the overall look of the F-16 will be improved in the rear end area. 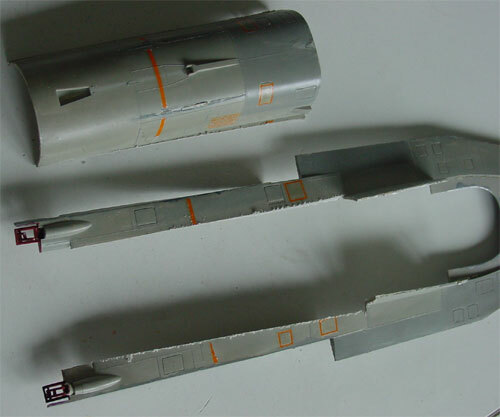 As I got from a Hasegawa F-16 kit the aft lower fuselage (part #A2) from the spares box of Peter, it was possible to replace the incorrect lower Tamiya section. 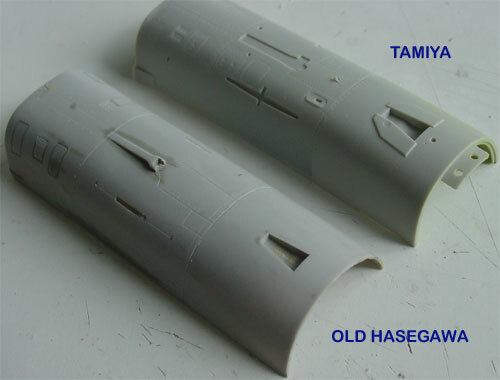 When checking the dimensions of the lower aft fuselage section, it turned out that the width was exactly identical between the Tamiya and Hasegawa kit (and by the way also identical to the Academy kit). The length was also nearly the same. 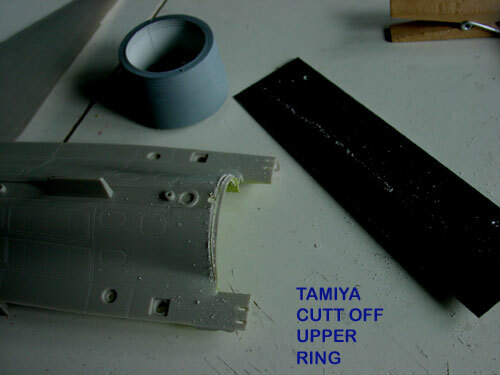 Tamiya aft section, a bit to squared, as seen below when comparing the exhaust pipe fairings.... it should be a circle. 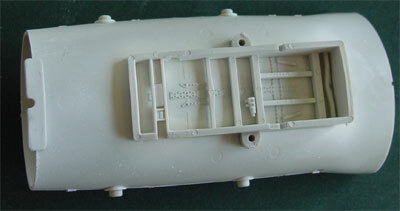 First, from the Hasegawa spare part #A2 the aft section was sawn out with a razor saw. The cut out part was sanded and cleaned up. 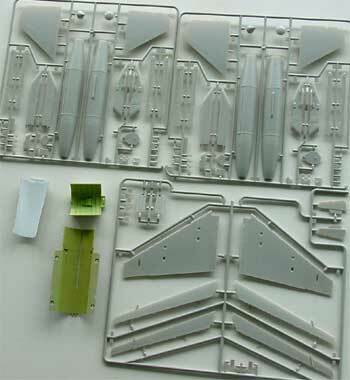 Panel lines were inscribed in the new part from Hasegawa. Here another comparison can be seen. In order to reach the correct total length it was also needed to saw off 1,5 mm section at the rear of Tamiya part # A1. Later on, the exact correct length will be achieved by adjusting the exhaust fuselage fairing. The merged parts together. Make sure to tape on the upper fuselage section #A1 to make sure the width is correct. The lower and upper fuselage section dry fitted and matched perfectly. Also, you will see that the main gear bay will fit perfectly, only some moulded small locator strips had to be removed inside the Hasegawa part. 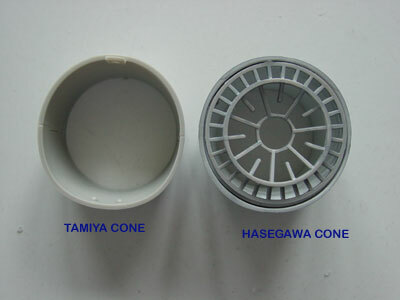 For the fit of a Hasegawa rear cone (part # J3), it was needed to remove 2 mm plastic in each corner. 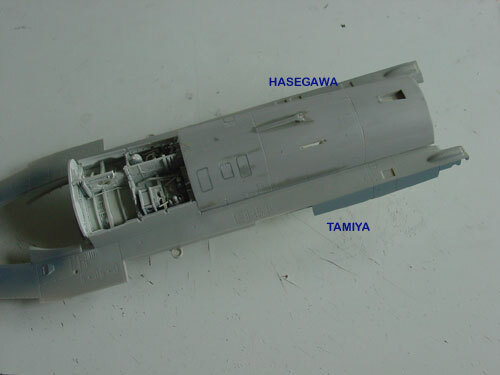 Now, the Hasegawa cone wil fit OK.
Next task was the work on the engine exhaust area. For the later "C" types, and also F-16C Block 50, the GE F110 is installed on the real plane. 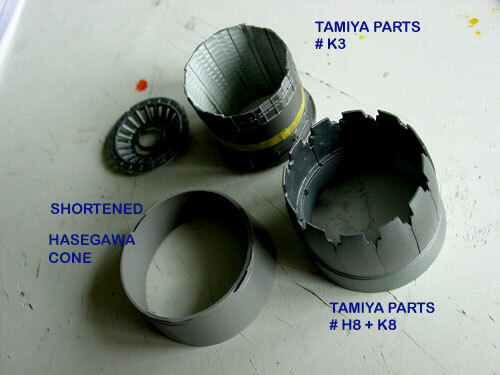 Tamiya provides a separate removable engine with a dolly, but unfortunately only parts for one exhaust pipe. (You are supposed to exchange this exhaust between either model or engine). 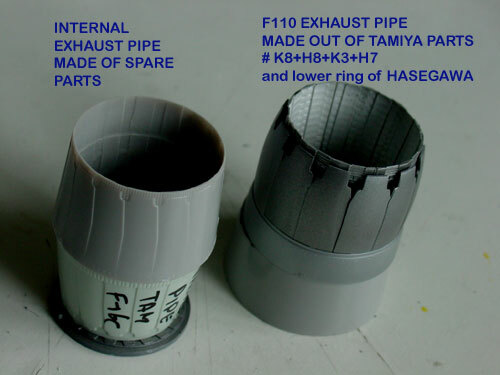 The Tamiya exhaust pipe looks very nice, so in order to use this on the F-16C model, it was decided to put these on the model; on the other hand it was decided to craft the spare Hasegawa F110 exhaust parts onto the engine itself, it would than be a model on its own (more on that later on). 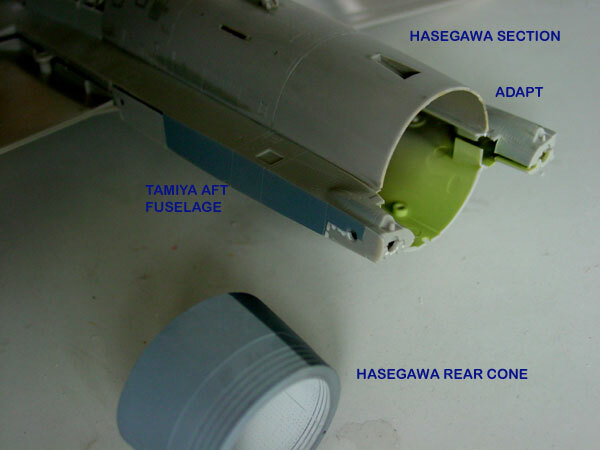 Note that the Hasegawa part #J3 will be used to get a perfect fit to the aft fuselage area itself. 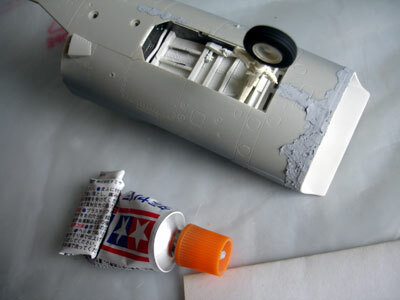 In order to fit the exhaust pedals of the Tamiya kit, it was decided to use Tamiya part # H7. 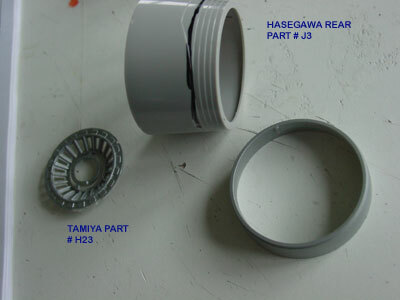 It makes it possible to craft both parts together and to get the correct length; it was needed to cut off 7 mm (0,3 inch) from the rear of the Hasegawa part #J3. This was done a razor saw and after some sanding, a good fit is achieved. Some putty may be needed here to get a very clean merge. The inner exhaust pipe was created by not using parts # K3 on the separate engine, but to set them into the exhaust itself. 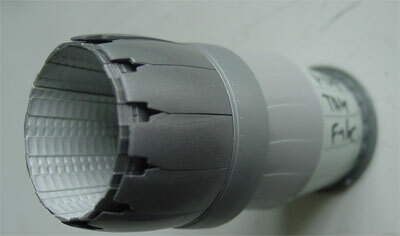 Also, the pipe would be given extra depth by using some spare parts. (In this case an old Revell pipe and a spare engine burning section , parts # E6 + E20 from the Academy kit; you can also search for your own parts in your spares box). The overall assembly of rear external exhaust and internal exhaust pipe. 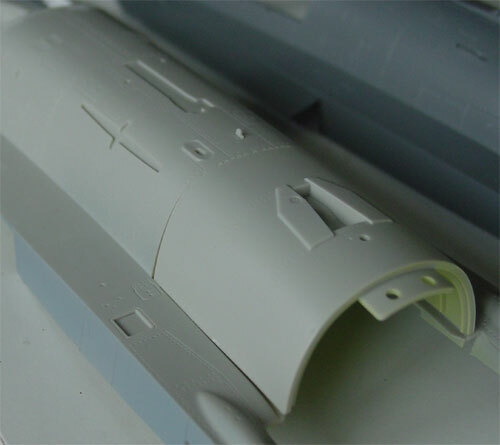 The exhaust area and lower fuselage area for the Tamiya model are now perfect. In step 24 and 25, as noted the rear of the lower fuselage was replaced. 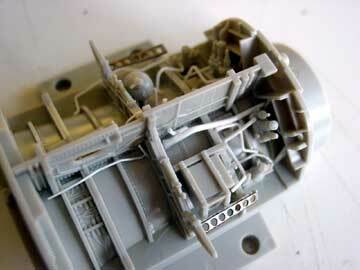 The main gear and arrestor hook parts were not installed, but the bulkhead # F12 and smaller details were added. The ventral fins #B18+B19 needed some sanding at their base to get the good position fit to the new belly and their notches were cut off. 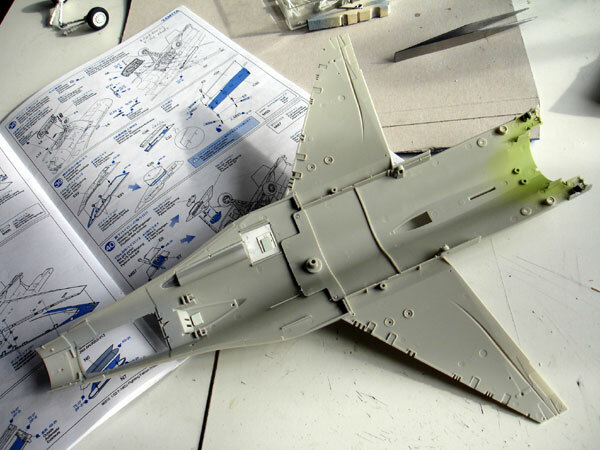 Step 26 : I added the flare dispensers, metal parts 'b1"; use what you need for your particular F-16C. 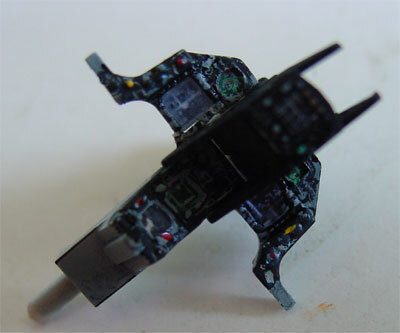 The Tamiya kit has very nice parts for the cockpit, with raised details on the instruments and so on. The Eduard etched metal set does not provide any improvement here as etched metal plates are simply nor "3 dimensional". Here you see the basic frame for the Tamiya tub, to which details are to be added. I did not like the "option to keep items removable", such as the seat etc. From parts #G15 and G17 the notches were removed. I also cutt off 10 mm from part # G14. 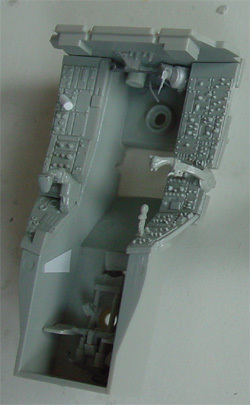 First, some piping and details were added at the rear bulkhead aft of the tilted ACES II seat and in the pedals as shown in step 31. At the cabin walls, also some extra detailling was added from rod and card. 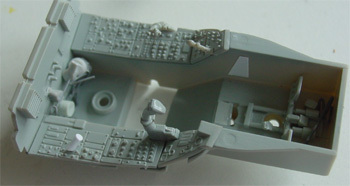 In the cockpit, some etched metal parts were used from the EDUARD cockpit set # 32052. The instruments and side panels got a first coat of medium grey. Details were painted satin black. After drying time, details were inscribed with a sharp needle suggesting instruction texts etc. The instrument knobs were painted light grey with a toothpick. Some details were set-out with red, yellow and white again with a toothpick. 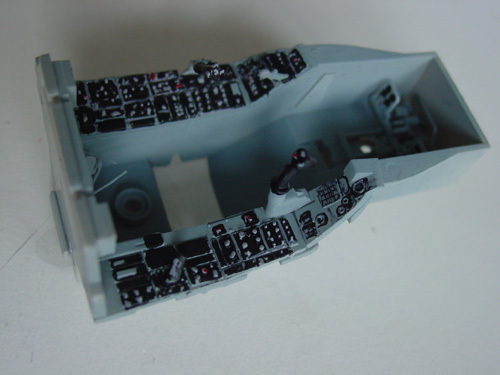 The instrument panel was painted and detailed. 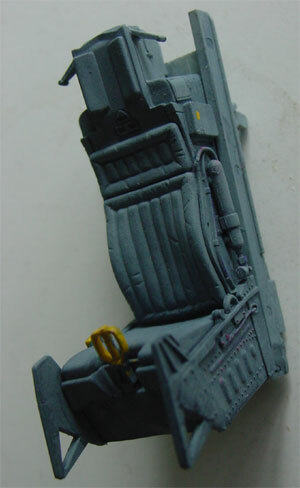 Some weathering will also be done with some light washes of darker grey in the cockpit. 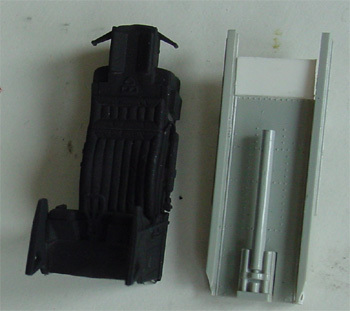 The Tamiya parts for the ACES II ejection seat are fine and were assembled as shown. Check out part #G9 as not all seats used on the F-16C's have the sensors. The seat can be detailed also using parts of the Eduard set. In step 30, the pilot was obviously not (yet) installed. Final finishing and adding metal and cotton seat harnesses as shown in step 29 to be done later on. Step 31 was not needed for closed ammo bay, except for the pedals . Skip step 32 for later. 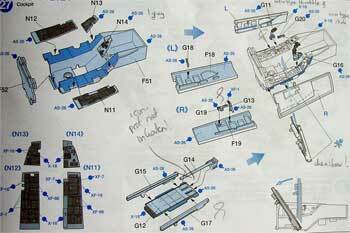 Steps 33-34: assemble the main parts as shown. It is a perfect fit! (I hope that Tamiya will come with a two seater F-16 in the future, as the separate part #B28 seems to suggest....). Please note that there is also a spare part #B17 not mentioned in the instructions, which is useful for some F-16 types, such as the MLU for example. NOTE: early F-16's before and up to block 30 have at the slat at the inboard position only "2" slat rotating fingers". Later block beyond block 30 F-16 have there "3" fingers. Probably this is modification applied later to cope with more stress. 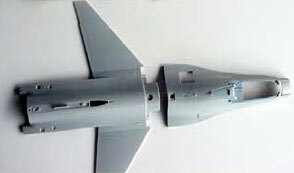 The old Hasegawa kits have indeed "2 fingers" which is correct for the earlier F-16's. 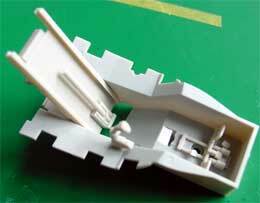 This Tamiya later block 50 F-16C has the "3 finger" style inboard slat rotating fingers" which is indeed correct. As the gun area was not to be displayed, these parts were assembled closed. It is recommended to fit gun tunnel part F44 and the panel door parts B6, B13 at this stage for better handling.